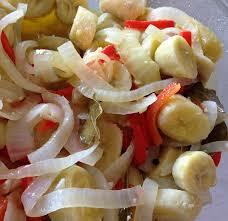 Guineitos en Escabeche (Green bananas in Vinaigrette) - Tienditadepuertorico.com - Buy Puertorican Food Here!! Boil bananas for 25 minutes or until tender but firm. Do not over cook. or until the onion and peppers are tender. and add the onion sauce and stir.